Today is Day Ten of Christie Wright Wild’s PB 14:14. In many picture book challenges, we are encouraged to use books that have been published in the last five to ten years. However, being the classic picture book nut that I am, I just had to get in a couple of the older stories. Here is one of my favorites. Frances is a little badger. The last few times she played with Thelma, her friend took advantage of her. This time, they are going to play tea party. Frances has been saving for a special china tea set. When Thelma hears about that, she persuades Frances to buy her old plastic tea set. Frances doesn’t want to until Thelma convinces her that no one wants a china tea set and plastic is better. Frances shows her sister the new old plastic tea set and her sister thinks she has been foolish. The more Frances thinks about it, the more she agrees. When she sees Thelma buying the china tea set with the money she had given her, Frances knows she has to be clever if she wants to trade the old plastic set back to Thelma. I won’t spoil the story for you…if you haven’t read it, you really should…and then read it to any young children you know. It is a wonderful story about friendship and ingenuity. CONFLICT: There is a lot of conflict in this story – Frances is saving her money: should she continue saving it for a tea set they might be all out of or should she spend it on something she can have now? Should she trust her friend, Thelma or trust her mom and sister? Should she turn the tables on Thelma to get the china set she wants or should she keep the plastic set she really doesn’t want? I especially love the part near the end. The story is also strong on plot and character…Frances is the star of several other books by the Hobans. And they also use rhyme and word play…in every book, Frances makes up rhyming songs to sing. This entry was posted in Christie Wild's PB 14:14, Top Ten Elements in Picture Books and tagged A Bargain for Frances, Conflict in picture books, Friendship, Lillian Hoban, Russell Hoban by viviankirkfield. Bookmark the permalink. Not sure I ever read this one, but I do so remember the Frances books. Thanks for bringing this one back to mind! I recognize the cover as a classic, but actually I don’t think I’ve read it. I love your summary – it’s so realistic. Kids go through so much friendship drama on a regular basis, and they really are so sneaky! I’ll have to check this one out. Thanks, Vivian. Sounds like a wonderful story of friendship. A warm summary on this cold morning! Like you, I wonder why “I” didn’t write this one! 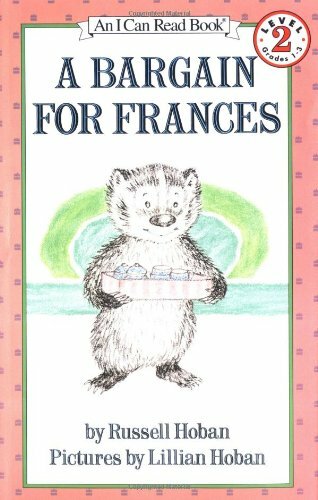 I am aware of some Frances books but had not seen this one. A great example of conflict. Good examples of internal and external conflict. Love some of the old classics..thanks for sharing! Funny how although some truly beautiful new books have been surfacing, some of the old classics will always be with us. Thanks for reminding us, Vivian! a classic. gotta love Frances.